Vienna has a long standing tradition of ice cream parlors, handmade from the freshest of ingredients in the Italian gelato style. If you ever venture to Austria‘s capital, finding your favorite ice cream parlor is a must, and our guide offers you the best in the city. Tichy is a family-run business, originating over 60 years ago in 1952. Nowadays, the legendary Tichy is run by the second generation of Tichys and a great central location guarantees that this ice cream parlor always stays busy. Tichys is a Viennese classic and an integral spot to visit as this is the only place where people can get the famous eismarillenknödel – vanilla ice cream with an apricot core, rolled in grated, roasted and caramelised hazelnuts. If you’ve purchased other variations of ice cream apricot dumplings, they won’t equal this patented delicacy. 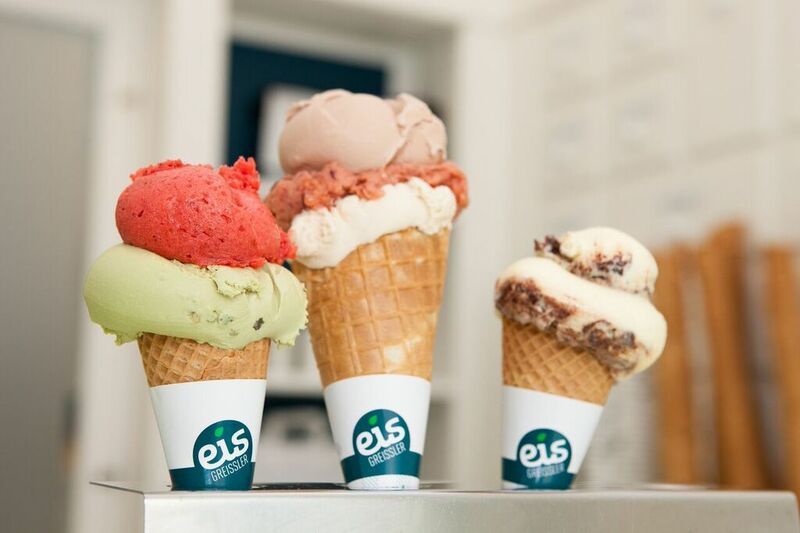 Eissalon Tuchlauben makes ice cream in real artisan Italian tradition. Eissalon Tuchlauben was founded in 1962 by a family of Perizzolo, who originally came from Trent. The ice cream is made daily, using Austrian milk, and only from the highest quality ingredients. Inside the parlor you will be transported back to the old days through the cozy retro interior with gleaming wooden panels. They don’t just serve ice cream; enjoy iced coffee, pancakes, frozen yogurt and even cakes. Eis Greissler make everything from scratch; they even have their own organic milk farm of 45 cows in Krumbach. One of the most honest ice cream parlors around, there are no artificial flavors, colors, or preservatives in their products. Even though Eis Greissler offers as many as 100 ice cream varieties, the menu shows notations for vegan options, as well as allergies, such as nuts or gluten. To ensure that customers never get bored, the menu changes seasonally, offering eclectic choices, such as as asparagus, goat’s cheese or garlic. Gelateria Hoher Markt serves some of the best ice creams and coffees in Vienna. Here you will find more than 30 different options of ice cream – in both classic and creative flavors – as well as fruit sorbets. In this modern Italian ice cream parlor and cafe, customers can also sample a hot and cold breakfast, croissants and cold meat plates. The menu also offers various creations made using ice cream, such as ice cream shakes, ice cream cakes, and even ice pizzas. In Zanoni Zanoni, customers can enjoy an extensive menu of ice cream creations, such as vegan ice cream, frozen yogurt, cakes, and some good old classic afogati – with or without alcohol too. The ice cream parlor looks quite impressive with a lot of outside seating and even heaters when it gets colder. This parlor is also a great little place for breakfast and light meals, serving croissants, toast, cold plates and sandwiches. Zanoni Zanoni stand for delicious quality and is definitely worth a visit if you’re ever in the neighborhood.